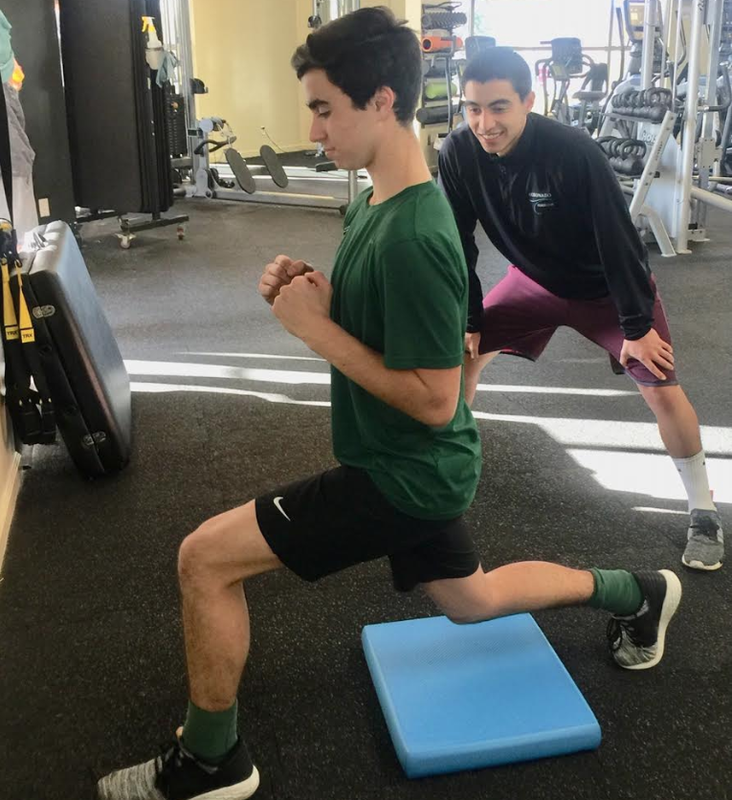 CFC fitness coach Kevin Bruno instructs CHS sophomore Quique Leon on proper training postures and form. Coronado Fitness Club personal trainers Carter Graves and Kevin Bruno now offer fitness classes to high school students. Students need not be club members to enroll. Back by popular demand, Kevin Bruno’s co-ed class, “Strength and Speed for Student- Athletes” safely and effectively builds muscle and endurance. Bruno is already a personal trainer for several high school athletes. His meticulous focus on safety and performance keeps this class popular among teens and their parents. This passion stems from personal experience, having sustained back injuries from incorrect training methods that ended his high school athletic career. Bruno turned his personal setback into a career as a fitness coach. He uses positivity, motivation and technical expertise to train people of all fitness levels to gain confidence, increase agility and speed. He has been with CFC “since the doors opened,” and leads fitness classes and trains clients of all ages and abilities to reach their fitness goals. A San Diego State University graduate and possessing several personal training certifications, Bruno has a passion for fostering performance while focusing on safe techniques to avoid injury. Carter Graves mentors a “Girl Power Boot Camp” designed specifically for high school girls of all fitness levels, focuses on wellness and goal-setting. She designs classes that are adaptable to young women who are newcomers, as well as to those with more gym experience. Graves’ passion for fitness stems from her history as an athlete, swimming competitively since age eight through Division 1 at Rice University. She also has several certifications in personal training, which she uses on a daily basis as a personal trainer and fitness class instructor at Coronado Fitness Club. Both the Girls Boot Camp (Tuesday and Thursday, 3-4 p.m.) and Strength and Speed (Monday and Wednesday 3:30 – 4:30 p.m.) are currently under way, but continue to accept students. For more information, call Coronado Fitness Club at 619-522-9200.